In our third year of working together with the Peralta Family from Nicaragua, we are looking to go more in-depth. With the help the our friends Julio and Octavio Peralta, we will get into understanding how coffee quality comes together on their family farms. We know it’s impossible to pinpoint the exact variables, but from the perspective of a coffee geek, it’s definitely worth a try! Quantitative research: Analyse the historical data from micro lot production in last two seasons. Select high potential farm plots that have shown to score high and consist in cup quality. Selection of first 10 farm plots. Qualitative research: Narrow down the selection to 5 farmplots. to by interviewing both the local Q-grader Marilec and agronomist Edwin results of the first harvest month December. Adopting your own farm plot: Each roaster interested in adopting a farm plot for a season, will have the opportunity to get an exclusive coffee, processed according to your preferred processing method and volume. If the coffee hits at least an 84+ we ask the roaster to finalize the reservation, but we aim for the surprise of higher scoring lots. 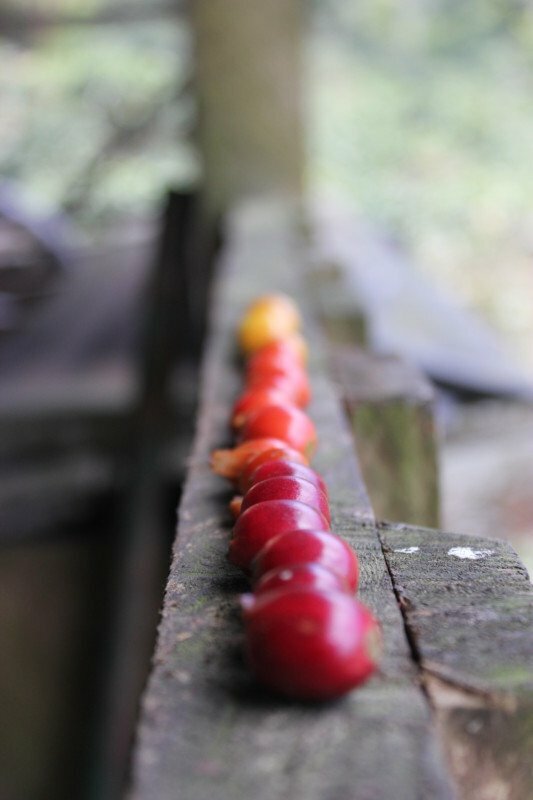 Follow your coffee: During February and March we will follow the coffee as it harvested and dried on the raised beds at the San Ignacio mill in Mozonte. Our green coffee reporter Joost Bosman will update us on the progress. You will be able to share the updates with your final customer. Want to receive fresh harvest samples? Participation can be used as tool to get your customers engaged, but is you can also take a the route by directly sharing a wishlist. All throughout the end of February to April we will receive fresh harvest samples from the micro lot program. Let us know if you are interested in getting a certain flavour profile, processing method, variety etc. and we will set out to find an exclusive micro lot for you. To understand structure, we quickly take you through the background and processing structure of the 5 farms. The family have five large farms on mountain range Dipilto-Jalapa, which separates Nicaragua and Honduras on the Northern border. During the Civil war this was the stage of the fighting guerillas, but now is the breeding ground for most of the Cup of Excellence winners in the last decade. All of the Peralta finca’s have had a top ranking in the COE somewhere in the last 10 years. The farms harvest throughout December to April, especially in the higher altitude sections of the mountains harvest hits later. Nicaragua is interesting in terms of high specialty production, as they use traditional methods for applying modern post-harvest processing of Natural, Washed and Honeys. The farms are managed centrally from the Mill where the agronomist Edwin goes out to visit them each day of the week. In close cooperation, Julio, Octavio and Q-grader Marilec, they work together with the farm managers on the different finca’s. During peak months of the harvest, the team sets out to produce the highest quality possible in the micro lots program. What do we define as a micro lot in Nicaragua? The definition of micro lots in specialty coffee is often completely different between production countries. In Nicaragua we do not only use the date of harvest, but add the geographical location. The so called farm plots come in different sizes, but often only grow 1 variety. This helps us to really taste the variety inside the coffee. The natural separations, such as mountain side, small streams and forest areas are used to divide the sections. Starting at 1150 mts, you often find shaded, almost forest-like sections, while on the cooler top side of the mountain usage of shade is very limited. Different micro-climates can be found on each farm, with variations in temperature, wind and rain. Not to mentions differences in soil composition between different areas. La Argentina: 1. Los Lirios* (Caturra, five lots), 2. San Martin (Caturra, three lots). Samaria: 3. Minas (Catuaí, nine lots); 4. Karolina* (Catuaí, six lots). El Bosque: 5. Ortéz* (Catuaí&Java, seven lots), 6. Felix* (Catimor, six lots). Newly planted lots that did well in their first season (2016/2017): Montañita in Samaria, Las Pilas in El Bosque & Los Pozos in Santa Maria. Next week we will get into more results from the historical analysis and get into the first updates from Nicaragua. The list will be narrowed down using the experience from Marilec & Edwin at Peralta Coffees and their view on the current status of each of the lots. Lower altitude area are already starting the peak of the harvest.